I left a little after 6am to get to the harbor and spend the better part of the day on Kruzof Island. On the way, I scared up a pair of Northern Flickers from a willow bush along the Crescent Harbor sidewalk. They flew up to a spruce tree near the parking lot and watched me as I walked by. If there had been more light, I probably could have managed to get a pretty good photo, but heavy overcast in the early morning is not conducive to available light photography. 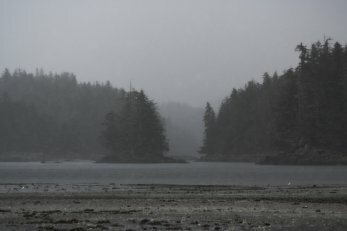 It was a good trip to Kruzof, while most of the group went south from our drop off point to check out the caves and intertidal organisms that are less common on the more protect shores along the Sitka road system, I headed north to see what I could find on the expansive intertidal mud flats of Port Krestof. I was hoping to see a few birds and was not disappointed. In addition to the birds, there was a sea otter hanging around not too far off shore. One of the other folks had a mink come up close to check him out. Weather: Typical early spring weather on a late spring date. Showers consisting of various mixtures of rain, snow, and hail fell throughout the day. When a little squall moved through, the wind would blow, but between them there was a light breeze. The sun showed its face a couple of times and we did hear one thunder and lightning storm. A couple of my students stayed at Salmon Lake cabin last night and got to experience a cabin rattling thunderstorm that lasted an hour or two. Flora: On the way back to the pick up location, I ventured inland a little bit to a muskeg. It was still quite brown, even the normally evergreen Labrador Tea leaves were brown. I think the March cold snap was pretty hard on the muskeg plants. It was pointed out to me that this year the plants are about 3 weeks behind last year’s pace. That seems about right to me. This entry was posted in activities, birds, daily, flora, marinemammal, photo. Bookmark the permalink.